I definitely don't want to botch things up!! I will follow your instructions. 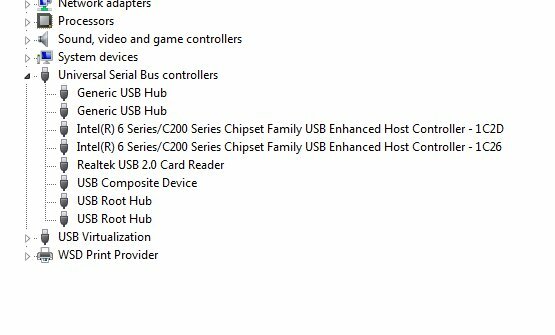 Just to be clear: I'm going to change the Power Management choice for the two USB Root Hub entries, then reboot, I will then uninstall ALL the entries under Universal Serial Bus Controllers. Is that correct? I'm guessing that those USB Controllers will reinstall when I reboot, but it's a little scary! Yep, your a above average user we usually work with! Remove the Roxio USB device don' want windows assigning drivers when you reboot the PC. "Intel® 6 series/C200 Series Chipset Family USB Enhanced Enhanced Host Controllers" are now "Standard Enhanced PCI to USB Host Controllers". Depending on the make of your PC those drivers should be on a Driver Disc or be available to download them. Yes, with the Roxio USB device not connected and programs disable, install V2D3Plus Driver .exe, reboot and then Plugin the Roxio USB Capture Device. OK, first the bad news: I disabled AntiVirus and firewall, ran V2D3Plus Driver .exe, and rebooted. As soon as I plugged in the capture device, Windows Update started to install the drivers, with the same result as every previous time. Now, the good news: I decided to try something different. I deleted the drivers, rebooted, turned off AV and firewall, and put the Roxio disk into the drive, choosing "Repair." It went through the entire process and told me to reboot, which I did. After turning the firewall and AV back on, I plugged in the capture device. Windows update started immediately BUT this time it installed both drivers successfully!!!!!! I wish I understood it better, but something you had me do allowed the repair process to work (that was one of the first things I had tried, remember?). I hope to be able to find the correct drivers for those USB controllers, but I'm assuming the generic ones will work ok. At any rate, the capture device is now functional! I can't really express how grateful to you I am (as well as others who responded) for your expertise and patience, and your willingness spend so much time with me. I moderated on a similar forum for a number of years (alarm systems, not computers). I helped quite a few people, although I had a mere 6,000 posts (a slacker compared to you!!). There were cases where I went back and forth with someone for days, just as you've done with me, so I know how time consuming and often frustrating it is. It makes me all the more appreciative of what you have done for me. So thank you, thank you, thank you. Very warm wishes for the Holiday Season and a wonderful new year! You did all the work!